New Territory Will Span Eleven Northern New Jersey Counties. Edison, NJ, February 15, 2018 --(PR.com)-- Durante Rentals has been selected as the new Takeuchi dealer for North New Jersey. The new territory will span eleven counties including Bergen, Essex, Hudson, Hunterdon, Middlesex, Morris, Passaic, Somerset, Sussex, Union, and Warren. The New Jersey based dealership will offer sales, parts, and service for the entire line of Takeuchi earth-moving equipment, including mini excavators, skid steer loaders, track loaders, and wheel loaders. The news comes as Durante’s New York based dealership, New York Takeuchi, was recently named as one of Takeuchi’s top dealerships in the entire country, based on total market share. “We look forward to continuing our strong relationship with Takeuchi as the new dealer for Northern New Jersey,” said Chris Hamblet, V.P. 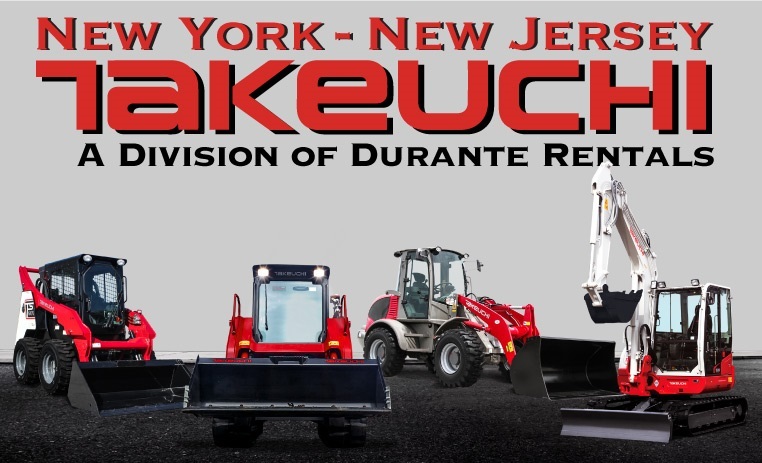 of NY-NJ Takeuchi Sales at Durante Rentals. “We’re confident we can duplicate the success we’ve had with our New York Takeuchi division as we’ll continue our winning formula of providing quality machines, honesty, integrity, and above all, the highest level of customer service in the industry,” said Chris. For the next few months, the Northern New Jersey territory will be serviced by the Durante Rentals West Nyack store, which borders Northern New Jersey, as well as their Brooklyn store, which provides easy access via the Verrazano Bridge and Outerbridge Crossing. “We are currently looking at strategic locations for our New Jersey based dealership,” said John Durante, Co-owner of Durante Rentals. “In the coming months, we plan to secure a prime location and assemble a professional and knowledgeable New Jersey-based sales team,” said John. The New Jersey location will also serve as Durante Rentals tenth rental store and its first in the state of New Jersey. They will offer a variety of construction rental equipment and tools including aerial lift equipment, material handling equipment, landscaping equipment, quality used equipment and more. Durante Rentals currently boasts eight New York based stores in Brewster, Brooklyn, the Bronx, Carmel, Elmsford, Flushing, Mt. Vernon, and West Nyack, and a ninth store in Danbury, CT.
Takeuchi is an ISO 9001 certified manufacturer of an extensive line of compact track loaders, compact excavators, compact wheel loaders, and skid steer loaders. Founded in 1963, Takeuchi was the first company to introduce the compact excavator to North America, setting the stage for one of the highest growth product segments ever introduced in the compact equipment market. The compact excavator has become a main line product for both rental and construction/utility companies. Takeuchi continued to lead the compact construction industry with the introduction of the first compact track loader to North America.